Dasharatha's children grow sufficiently trained in all sort of skills under the guidance of Guru Vasishtha. From the childhood, Rama and Lakshmana are inseparable. Dasaratha had an word, with all his ministers to get opinion on whether he can get Rama married or crown Rama as the king of Ayodhya. Meanwhile Sage Vishwamitra arrives at the palace. King Dasaratha was alarmed at the news of Vishwamitra’s arrival. He looked towards sage Vasishtha. The sage said, “Don’t worry. Let us hope Vishwamitra’s visit proves auspicious. Please go and welcome him.” Acting upon the advice of the family priest, King Dasaratha at once went out of the palace to receive sage Vishwamitra. He touched the sage’s feet and said, "Your pious presence has made Ayodhya a holy place". The king led him to the court and offered him a seat near sage Vasishtha. When Vishwamitra had taken the seat, Dashrath said with folded hands, "What service can I render?". "The Rakshasas create trouble and let us not to perform Yajnas. They throw bones and filth into the sacrificial fire". Sage Vishwamitra further said, "We, the sages and ascetics, want you to provide us with protection". "Stop worrying, Your Holiness! I shall send my soldiers who will kill any Rakshasas who comes near your Yajna altar. And, if required, I myself shall go there. You may rest assured", said King Dasaratha. "No, your solders will be of no help. Send Rama with me. Then every thing will be set right", said Vishwamitra. King Dasaratha was put in dilemma. He got nervous and said, "How can little boy Rama fight those numerous Rakshasas?". "You are free to refuse if you so desire", saying this with anger, Vishwamitra got up to leave. When sage Vasishtha saw that Vishwamitra was annoyed, he pleaded with him not to get agitated. He requested him to take his seat and said, "Please be calm". "Why don’t you ask Dasaratha not to argue but to do as I say?" said sage Vishwamitra. Sage Vasishtha said to King Dasaratha, "O King! Don’t be a slave of blind love and ignorance. 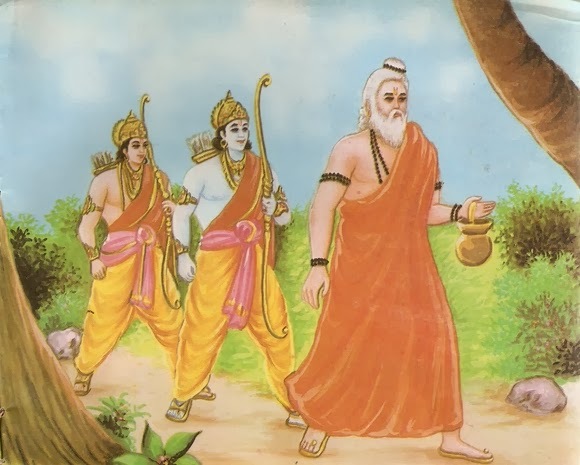 Let Rama and Lakshmana accompany sage Vishwamitra to the forest. They will be gaining something there". Dasaratha's fears were removed. He at once called Rama and Lakshmana there and, handing them to Vishwamitra, said, "Please excuse me. I was at fault. Now on wards, they will be at your service till you so wish". There is no reason to be worried of. Both of your sons will return richer with experience", thus assuring King Dasaratha, sage Vishwamitra led Rama and Lakshmana out of the palace. Vishwamitra, along with Lord Rama and Lakshmana travel far from Ayodhya towards the deep dense forest and pass through this place known as Kama's Grove (Kama Ashram), a small Saivite hermitage. They all stop for the night at this place. Before arriving, Vishwamitra endows both Rama and Lakshmana with the powers of Bala and Atibala, the two most powerful Brahmanic mantras which grant them super-strength, speed, and power beyond that of any normal mortal being. Kama Ashram was known as Punya Ashram in those days. Many Sages have performed various tapas (ascetic practice voluntarily carried out to achieve spiritual power or purification) here. After Lord Rama's visit, this place became more popular. One can find a huge pushkarni (temple tank) while entering this place. We all took holy dip and sprinkled the water from this pushkarni over the head. After holy dip, we all moved towards the temple. 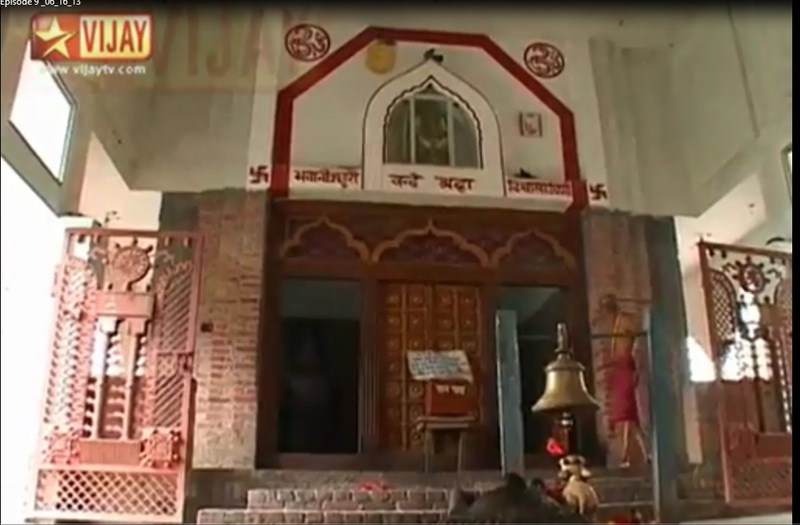 Significance of this place: In those days Lord Shiva had been meditating regularly in this ashram. The god of love is called Kamdeva. He is shown as a handsome youth, carrying a Sugarcane bow and five flower tipped arrows. His vahana or vehicle is the parrot. The legend has it that when Lord Shiva's consort Sati committed herself to fire due to disgrace shown by her father Daksha to Shiva, Lord Shiva became extremely sad. He renounced his worldly duties and went into deep meditation. Meanwhile, the daughter of the mountains, Parvati started meditating to acquire Shiva as her husband. Moreover, since Shiva was least interested in the affairs of the world, complications began to generate in matters of the world which made all the gods concerned and afraid. The gods then seeked the help of Lord Kamadeva, the god of love and passion to bring Shiva back to his original self. Kamadeva knew that he might have to suffer the consequences of doing this, but he accepted to shoot his arrow on Shiva for the sake of the world. As planned Kama shot his love arrow on Shiva while he was in meditation. This made Shiva extremely angry and he opened his third eye - reducing Kamadeva to ashes, hearing the pleas of Rati, Kama's wife, Shiva restored him, but only as an emotion. This bodiless form of Kama is called Ananga. However, Kamadeva arrow had the desired effect and Lord Shiva married Parvati. Hence this place gets the name Kameshwara Ashram. 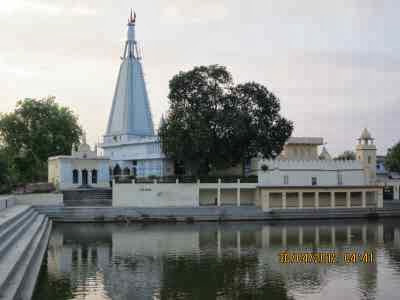 Now, this place is known as Kameshwar Dham. It is situated at Karon village near Chetpada Gaon about 36 kms from Buxar. This is located after crossing the bridge. One has to take the immediate right turn after crossing the bridge. Less known place hence the village name has to be told. 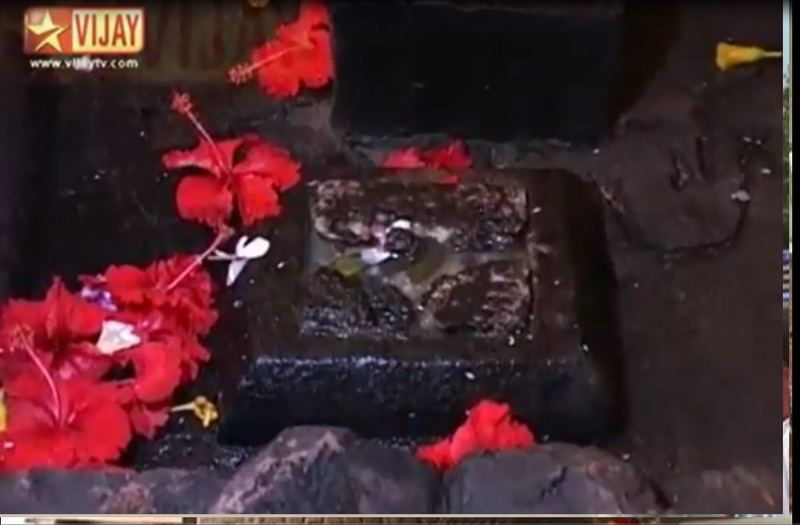 One can have the darshan of Lord Rama's feet here. We can find the installation of Lord Rama's lotus feet in all the places, wherever Lord Rama has traveled. This place is where Kama devan was burnt by Shiva Rudran. Similarly, when we visit this place, an individual will break away from attachment to the physical world and clean his inner self of offensive desires in order to experience the bliss of the Self. An inscription about Rama's visit with Lakshmana and Viswamitra is mentioned near the archway. Rama and Lakshmana spent one night at this place. Viswamitra narrated the incident of how Manmatha was burnt to ashes by Shiva. We also prayed for removal of material desires. There is a temple dedicated to Shiva. Meaning: O Rama, son of Kausalya, the sun is about to rise in the eastern skies; please arise to offer the early morning oblations. Uthishta Kamalakantha trilokyam mangalam kuru. Meaning: Arise O Govinda the holder of flag with Garuda emblem; Cast aside your sleep to bestow your protection and solace to the Universe. The above verse of Venkateswara Suprabhatam is being chanted every day in Tirumala Tirupati. It is said that the first verses of the Suprabatham were said by Vishwamitra. The Venkatesha Suprabatham was rendered by Prativathi Bhayangaram Annangaracharyar, who was a disciple of Sri.Manavala Mamunigal (the Vaishnavite saint). Vishwamitra watches the sleeping princes — Rama and Lakshmana. He wants to teach them many mantras. The purpose of the Rama avatara has to be fulfilled. So Vishwamitra is going to teach Him and Lakshmana some mantras that will be useful when they confront demons. If they learn these mantras (Bala and Atibala), they will not feel the pangs of hunger, or the need to sleep. Whatever form the demons take, they will be unable to harm the princes. So Vishwamitra wakes the princes up so that they can have their bath and then ready themselves for learning the mantras. Usually, at the palace, Rama would be woken up with music. But that is not possible in the forest. Here, Vishwamitra wakes Him up with His verses, beginning with the words, "Kausalya Supraja Rama". Where was the sloka "Kausalya Supraja Rama" born? We can say roughly, it was born in Kama Ashram. But, we don't find any description of this sloka in the next day after the previous night's stay in Kama Ashram. The description of this sloka is available in the respective sargam, before they decided to stay a night at Kama Ashram. 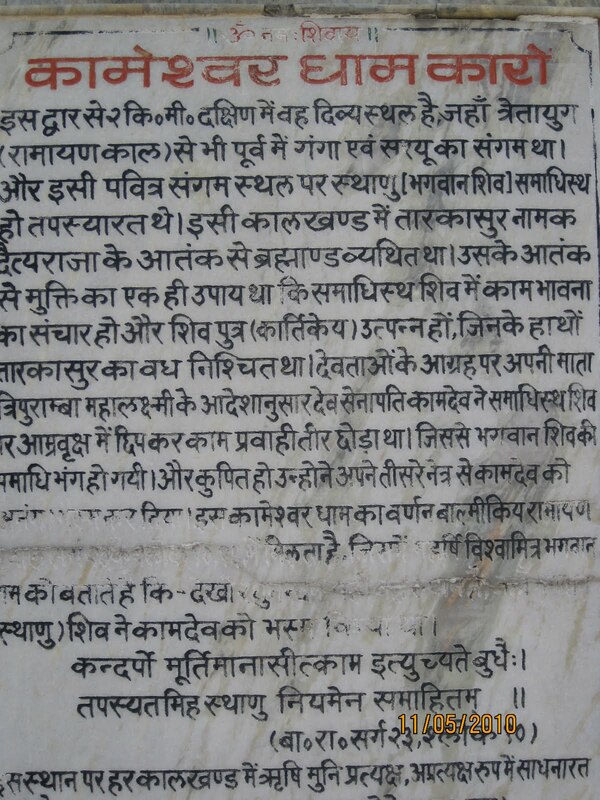 One can find a place near Siddhashram, where they claim it to be the birth place of this sloka. Lord Rama left to Siddhashram after visiting Kama Ashram. But "Kausalya Supraja Rama" was born before Lord Rama reaching the Siddhashram. 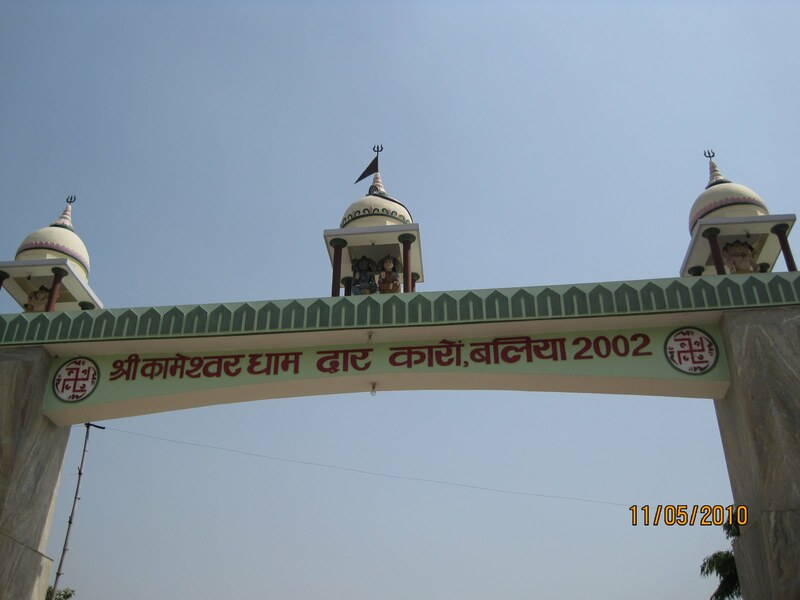 Even though the exact birth place is unclear, we can surely say that it was born somewhere between Kama Ashram and Buxar. Meaning: Then on travelling some more distance those two great valiant ones, there they have seen the divine river that courses in three ways, namely Ganga, at the auspicious confluence of River Sarayu. Meaning: In this Slokam, Kuresar describes the many paths taken by Deva Gangai, which arose from Lord Varadan's Tiruvadi. Oh Varadaraja! The Deva Gangai, which arose from Your sacred feet split in to four parts (varada! tvat padabje prajata sura sarit caturdha abhavat). One of them fell on Simsumaram, the assembly of stars at dhruva Mandalam and is still borne by dhruvan (tata: tasu ekam dhruva: dhatte). One of the branches of the deva Gangai from the dhruva Mandalam split in to three parts and flowed onwards and sanctified the tribhuvanam: earth, Akasam and the nether world of patalam (sa trin patha: bhavayanti sati tribhuvanam apunat). Among those triad, the one flowing upwards to Akasam was received by Sivan in His matted locks and that purified Him (tatra kham vrajanti eka tu sivam sivayati). That which entered the Jadai of Sivan divided further into seven parts (sa puna: saptadha abhut). One of those seven branches purified this earth and helped the sixty thousand sons of sagaran to reach the svarga lokam (tasu gam punana eka sagaraja svarga sargam cakara). Bhagiratan, the scion of Sagara lineage performed the tarpanam with the Ganga waters, drenched the ashes with the sacred Ganga waters and gave sadgati to his ancestors. The happenings during Lord Varadan's avataram as Trivikraman are described with particular emphasis on the Ganga avataranam. This generation and descent of sacred Ganga from the illustrious feet of the Lord and its many encounters in the three worlds are covered extensively in Srimad Bharatam, Ramayanam, Vishnu Puranam and Sri dehalisa stuti of Swamy Desikan. Confluence of Ganga and Sarayu, two most sacred rivers of India is situated at Chapra (Bihar). We have to travel around 02 hours from Kama Ashram to reach this place.